The 32-year-old will help Jono Gibbes and Dwayne Peel at Ulster during his continued layoff. Schmidt said he is in discussions with Payne over his future. 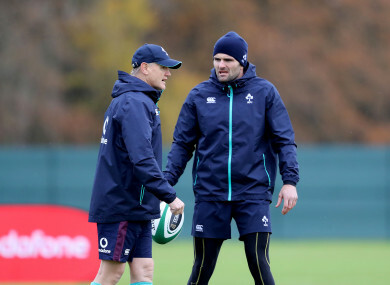 JOE SCHMIDT HAS welcomed the news Jared Payne has taken on a role in the reshuffled Ulster coaching ticket as he continues his comeback from persistent migraines which threaten to end his career prematurely. Payne was forced to return home from the Lions tour in New Zealand after being stood down due to migraines and while he received the medical all-clear at the time, the 32-year-old has not yet returned to competitive action. Any attempts to make a comeback have been undermined by relapses after training, with heavy workloads seemingly exacerbating the issue, and there are now serious doubts over whether Payne will play again. Speaking on Tuesday, Ulster’s team manager Bryn Cunningham revealed Payne will take on coaching responsibilities alongside head coach Jono Gibbes and assistant coach Dwayne Peel following Les Kiss’ departure. “He is still injured at present and unavailable to play, but he has got a fantastic rugby brain. He is one of the smartest players in modern day rugby,” Cunningham said in a statement. Asked about Payne’s new role with the Ulster backline, Schmidt was effusive in his praise for the 20-time capped Ireland international. “Jared might not be finished playing the game yet,” the Ireland head coach said. “I’ve had discussions with Jared, they’re ongoing, and we’ll continue to have those discussions. He’s in great shape so I wouldn’t rule him out. “He’s got a real understanding of the game so to have him involved in coaching [at Ulster] and to have that experience that he brought to our team, I think you only have to ask the players how comfortable he made other players feel because he understood the game. Email “'He's got a real understanding of the game': Schmidt welcomes Payne's coaching role ”. Feedback on “'He's got a real understanding of the game': Schmidt welcomes Payne's coaching role ”.